The South African Qualifications and Certification Committee (SAQCC Gas) is an association mandated by the Department of Labour to register all Gas Practitioners in South Africa. The primary objective is safety and the organisation encourages compliance and safe practices. Although SAQCC Gas has seen a significant increase in the number of registered Gas Practitioners over the years, there are still areas of concern. For that reason, SAQCC Gas has lined up roadshows to various cities to educate and inform industry players, interrelated industries and end users on the Pressure Equipment Regulations (PER) and safety when working with various gases. 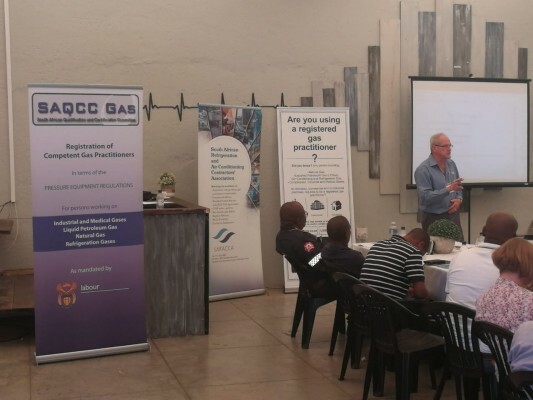 On the 27th September 2018, the SAQCC Gas hosted its inaugural roadshow in Polokwane. The team was joined by representatives from the Department of Labour (DoL), the Department of Environmental Affairs (DEA) and local Fire Department officials. The day began with registration, breakfast and an opening presentation by Mr. Jakes Malatse, Director of Electrical and Mechanical Engineering, DOL, and was attended by 30 individuals from various industries who are directly involved in the gas industry and those who are in affiliated industries. SAQCC Gas is made up by four member associations, namely the: South African Refrigeration and Air Conditioning Contractors Association (SARACCA), Southern Africa Gas Association (SAGA), Liquefied Petroleum Gas Safety Association of South Africa (LPGSASA) and the Southern African Compressed Gases Association (SACGA). The member associations gave informative presentations, covering the specific gases they govern. John Parry, the President of SARACCA and a Director on the SAQCC Gas Board, gave an overview presentation covering SAQCC Gas and its mandate. In his presentation, John unpacked what the regulations say about industrial, commercial and residential gas use and the Pressure Equipment Regulations (PER). These regulations set out the requirements regarding the design, manufacture, operation, repair, modification, maintenance, inspection and testing of pressure equipment. The regulations also require a Certificate of Conformity (COC) to be issued on completion of any gas installation, this verifies that the installation is compliant with the current regulations. In terms of the Occupational Health and Safety Act, 1993, the PER also requires persons undertaking the installation of any gas systems to undergo specific training and to be registered with SAQCC Gas. 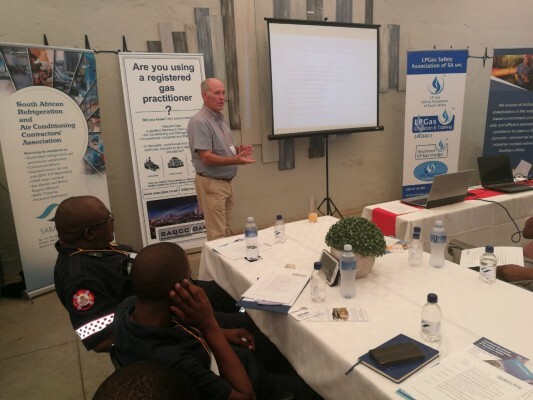 SAQCC Gas Director, Roy Lubbe, who is also the Chairman and CEO of the Southern African Gas Association (SAGA) discussed the Equipment/Appliance verification schemes required as per the Pressure Equipment Regulations (PER). During his presentation, Roy mainly focused on the Safe Gas Equipment Scheme (SGES) affecting Industrial applications. As the verifying authority for Natural Gas and Liquefied Petroleum Gas industrial equipment (in conformance with the SANS 329) SAGA has established the SGES to ensure that all equipment imported and installed in South Africa is safe and fit for the intended purpose. Through this scheme, a Verification Permit is awarded to the Importer for equipment applied for. During site visits of a few companies around Zeerust by the Department of Labour Inspectors and SAGA, it came to the fore that gas installations are not conforming to the PER and respective health and safety standards and therefore deemed illegal, invalid and unsafe. Contravention orders were issued by the Inspectors which will follow its own process to rectification. Barney Richardson a director at both SAQCC Gas and SARACCA, discussed the refrigeration registration categories. There are two categories in refrigeration, category A and category B. Category A Gas Practitioners are authorised to install refrigeration piping, components and equipment, install and maintain refrigeration units using Hydro Carbon Refrigerants (R600a & R290), install and maintain room air conditioning units up to 18kW cooling capacity, and authorised as an air conditioning & refrigeration Apprentice/Learner. While a category B Gas Practitioner is authorised as a refrigeration Artisan using Synthetic Freon gases and Hydro Carbon refrigerant gas, a specialist Carbon Dioxide (R744) refrigeration practitioner, authorised as a specialist Ammonia (R717) refrigeration practitioner, a specialist motor vehicle air conditioning practitioner, a specialist refrigerated transport practitioner, and authorised as a specialist marine refrigeration practitioner on all types of refrigerant gases. Kevin Robertson, the current Chairman of the SAQCC Gas and the CEO of the LPGSASA gave a presentation on behalf LPGSASA with regards to the safety aspects when installing LP Gas. The LPGSASA promotes safety in the industry through a variety of training courses within the Domestic, Commercial and Industrial sectors. Training is structured to ensure complete understanding of the requirements of the relevant South African National (Safety) Standard, SANS 10087 part 1 to 10, which deal with the handling, storage, distribution and maintenance of liquefied petroleum gas (LPGas). Trained individuals still have to be registered with the SAQCC Gas and these registered Gas Practitioners are required to undergo a Refresher Course every after 3 years. 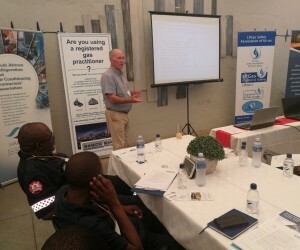 Kevin had an interactive presentation which also encompassed the issues within the LPGas industry, such as the difficulties in identifying and locating ‘illegal’ installers, and the debate on who should be held responsible for ensuring that only registered Gas Practitioners are contracted.